2006 marks the 150th anniversary of the Eight Hour Day in Victoria. Action taken by stonemasons on 21 April 1856 led to the establishment and maintenance of the Eight Hour Day, recognised internationally as a world first. 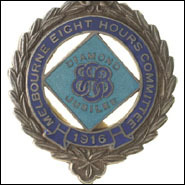 The Eight Hour Day became a symbol of the rights of workers to organise to achieve their rights not only as workers, but as citizens in a democratic society. The timing of this anniversary could not be more appropriate, given the emerging debate about contemporary work issues such as working hours and work/life balance. Watch the video April 2006. Celebrate the 8 hour day by working an 8 hour day!